Put the paper in the bag. Then take a moist sponge and cut it into smaller pieces. 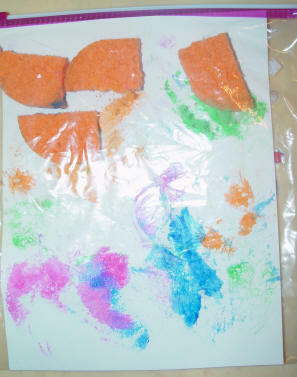 Press each piece of sponge into a different color paint and then put them all inside the bag and close it. Then put the bag on the table and let your toddler squish down on the sponges and see how they put the paint on the paper. Let him shake the bag to move the sponges around and squeeze down on them again. Then when he’s done take out the paper and let it dry! No mess!!! !